On Mother's Day this year, my kids gave me gifts and cards, and my husband spoiled me. Really spoiled me. He brewed coffee and made me a mimosa. That was followed by brunch - a yogurt parfait, scrambled eggs, bacon, and toast. I spent the afternoon doing things that I wanted to do: a little blogging, some reading, and enjoying the nice weather outside. I'm really not trying to make you jealous, but my husband even washed and waxed my car! Have I mentioned that my husband likes to cook? Not only does he enjoy cooking - he is a very good cook! Although I'm the primary meal-maker in our family, he often likes to fix breakfast, and sometimes prepares dinner on the weekends. Yes - I am very lucky. The offer was made to make dinner on Mother's Day. A nice bottle of wine with cheese and crackers, followed by a salad, steamed clams, and crunchy bread. As I said - I'm very lucky! On Mother's Day, my husband made this salad without mushrooms, but decided the next time he made it to add them. had it again (twice) this week. So simple and quick to prepare, but beautiful and delicious. Things don’t always have to be complicated to be special. This salad is proof of that. In fact, it may even be a stretch to call the instructions for it a “recipe.” But, like the famous Iceberg Wedge Salad, the simplicity of the ingredients and the need to slice through the lettuce leaves with a knife and fork are part of its charm. The structure of this salad is based on my husband's memory of a ceasar salad he had once in a restaurant. I believe the ingredients were determined by what was in our fridge. And they were perfect. 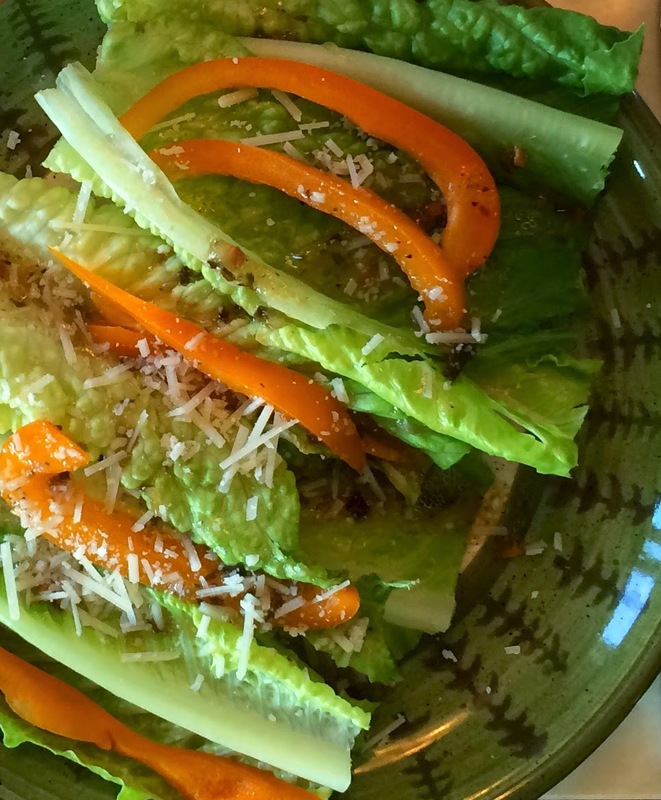 My husband has given me permission to write down and share with you how he makes this simple salad. I suspect you will like it just as much as we do. On individual salad plates, arrange the romaine lettuce leaves side-by-side. Add shredded Parmesan, salt, and freshly ground pepper, to taste. My husband used Safeway Select Basil & Sun Dried Tomato Vinaigrette. It was delicious, but feel free to substitute your favorite brand or homemade vinaigrette. Mushrooms are optional, but add lovely texture and taste, if you like them! The next time you need an elegant and delicious but easy to prepare salad, this might be the perfect one. Orange, yellow, red or any combination of bell pepper slices is nice! Print this recipe and leave it where it can be found. Perhaps a person in your life will make this salad for you, too! Sounds delicious and a very pretty presentation too! Sounds like you had a great Mother's day. Sometimes for family meals I don't think a lot about how it looks on the plate. My husband does a really nice job of this when he cooks, though! None of the men in my house cook, pretty much ever. Hubs will use the grill but I have to make all of the sides. Your dinner sounds like my idea of heaven. Lucky you. It is nice to be fed once in a while! My son also has some interest in learning to cook. Maybe there is still hope for your guys! Yum. I do love me a good salad. And am very glad that you were suitably cherished and pampered for Mothers' Day. It was a lovely day - and I love salads too! So glad you posted this today. We've been having "salad night" once a week, and this will be a perfect addition to our rotation! Great photos! Let me know what you think of it Lana. It is certainly quick, because you don't have to tear the lettuce! My husband will do a lot of things but cooking isn't his thing. He'll use the grill, or cook if I'm sick. That mainly consists of lunchmeat sandwiches and soup. He does a lot so I won't complain. That looks delicious and I love that salad. We love mushrooms. I'm glad you had such a fabulous Mother's Day! P.S. Making the salad. Which is now called Susan's Husby's Salad. They really did do well, didn't they! And Diane, my husband will be so honored! I have shared some of your posts with him, and he loves your sense of humor! Oh my gosh your meal looks amazing!! Where is your husband's cookbook? How did I miss this post? It just popped up now in my FB feed. Looks and sounds yummy. I love the simplicity of it. And your photos are making my mouth water. You may have missed the post - but I missed your comment until now!! It is a very quick and easy salad! !